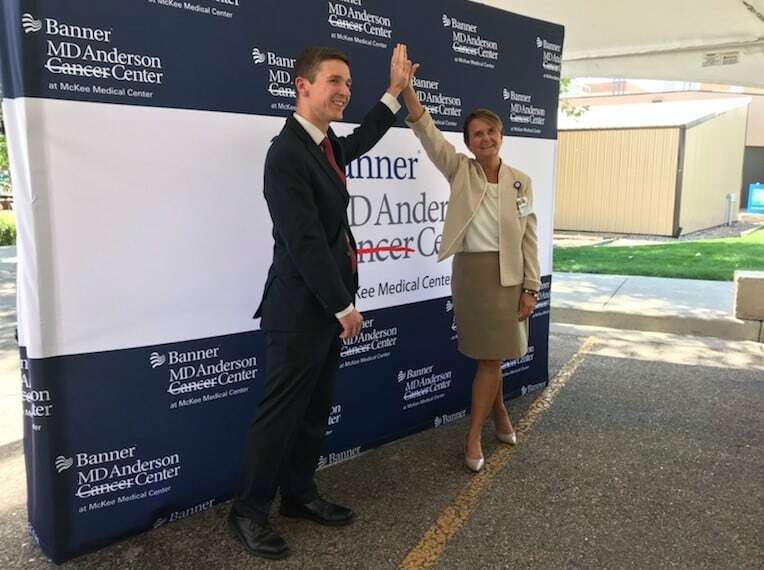 Jeff Albert of MD Anderson and Margo Karsten, CEO of Banner Health's operations in Northern Colorado, celebrate the announcement of a partnership between the two health-care systems on Thursday at McKee Medical Center in Loveland. Courtesy Banner Health. LOVELAND and GREELEY — The University of Texas MD Anderson Cancer Center is partnering with Phoenix-based Banner Health to provide services at Banner’s hospitals in Loveland and Greeley. Banner made the announcement Thursday at McKee Medical Center in Loveland and is scheduled to make a similar announcement Thursday evening at the North Colorado Medical Center in Greeley. The arrangement is an extension of a partnership between Banner Health and MD Anderson operating a cancer center in Gilbert, Ariz.
MD Anderson cancer centers specialize in cancer treatment and research. A key service of the cancer centers is that they provide a group of specialists to discuss and share insights on each patient’s case. The collaboration allows NCMC and McKee to provide greater access to advanced cancer care to adult patients in Northern Colorado. Patients will continue to see the same care teams at Banner at Loveland and Greeley campuses, but will have access to MD Anderson protocols and practice standards. In addition, patients will benefit from their physicians having greater clinical integration with disease-specific specialists in Gilbert and Houston. Earlier this month, MD Anderson was ranked No. 1 for cancer care by U.S. News & World Report’s annual Best Hospitals survey. Since the survey began in 1990, MD Anderson has been named one of the top two cancer hospitals, and it has ranked first 14 times in the last 17 years.